I’ve made many batches of apple wine before, but never so late in the season. Temperatures during primary fermentation were cool, between 60-70°F. I also suspect that I moved the carboy downstairs to the basement too soon (58°F), slowing secondary fermentation. Lesson learned: keep the chill off the wine while it’s actively working. 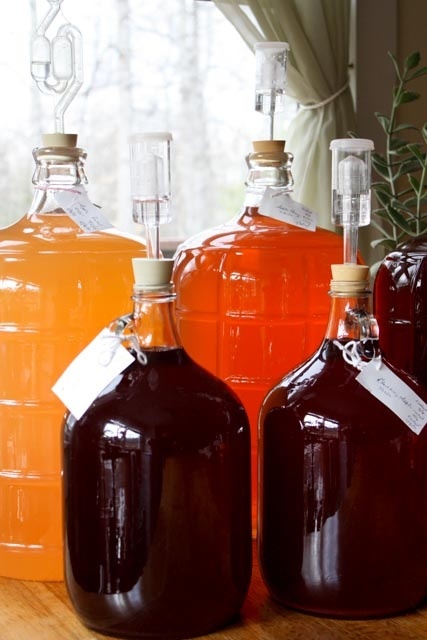 Many of my first wine making projects begin with recipes in The Joy of Home Wine Making. It's still one of the first books I consult when I need a refresher course on a basic topic. 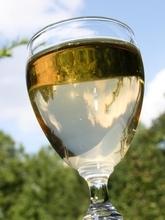 If you’re going to make apple wine or other country wine creations, Making Wild Wines & Meads is one of the books you’ll need for looking up random topics, like how to clear cloudy wine. Time cures many ills in the world of homemade wine, but it wasn’t helping with a 3-gallon batch of apple wine started in September 2010, using our 'Liberty' apples. That apple wine would not clear, despite a move from basement to main floor to raise temperatures, and two extra rackings. My time is in short supply right now, and Roger-the-wise pointed out that peasants have been drinking cloudy wine for centuries. I decided to bottle up two thirds of the batch, and subject one gallon to a selected fining procedure. In wine making, “fining” means using a substance or process to cause cloudy wine to clear by making fine particles drop out as sediment. My notes for the batch looked more detailed than usual (I even checked the specific gravity), so I don’t think I forgot the pectic enzyme. If my fruit tended to set starch, I think I would have seen a jelly-like goo by now. This left me with a possible protein problem. The commercial cure, bentonite, is natural enough, but I’d have to mail order it and the idea of putting clay in my wine sounded dirty anyway. I did this by washing a fresh egg very well. I cracked the egg into a bowl, and put both halves of the un-rinsed eggshell in a 300 degree oven for one minute. Then I crumbled the sticky eggshell into the gallon of cloudy apple wine, where it floated to the bottom. A few hours later nothing had changed, but five days later the eggshells had risen to the top, coated with a brown scum. 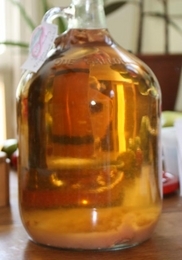 The cleared apple wine sparkled with a golden color, except for a sizeable cloud of sediment studded with eggshells at the bottom. I racked it, waited a month, and bottled the batch. It was wonderful wine! I have since tried the method with a batch of pear-raspberry wine with good success, so it's a simple wine making skill worth knowing. Home winemakers are eternal optimists. Here is an assortment of my homemade wines, out in the light on racking day. While the wines settle in a cool, dim room, I cover the glass carboys with old T shirts to keep out light that can cause unwanted color changes. 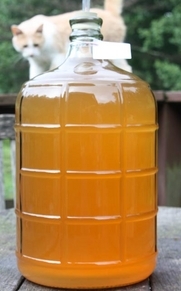 The 3-gallon batch of cloudy apple wine posed for pictures with Mr. Leon before the eggshell intervention. 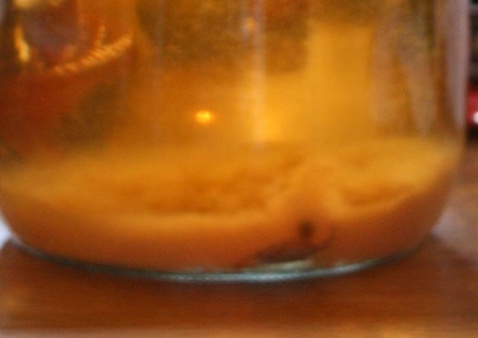 After a week, the eggshell caused the cloudiness to let go and accumulate in the bottom of the jug of apple wine. Need a recipe for apple wine? Please see my page on making apple wine with frozen apples. 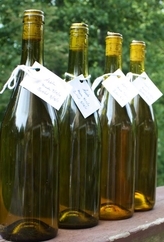 I also have pages on homemade rhubarb wine and homemade mint wine. I'll be adding my report soon on blueberry wine, which has become one of my specialties! My newest book, Homegrown Pantry, explores the most practical preservation options for dozens of crops, which includes home wine making. The most enjoyable wines start in the garden! I have an awesome double raspberry wine in progress, made with a mix of red and black raspberries, some of my favorite wine-making fruits. I write fiction, too! Thanks so much for supporting my work.